“RC,” as we call her, will be a dry yearling for the 2019 show season. She received her restricted leg in 2018. 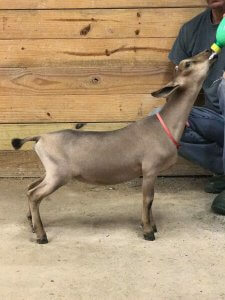 She is the grand daughter to the 2017 ADGA National Champion, CH Old Mountain Farm Merriment, and she is sired by the 2017 ADGA Premier Sire, Old Mountain Farm Keidan Quinn.